Golf performance tracking is a rapidly expanding market. In recent years, various new brands have elbowed their way into the sector, by making the most of existing and new technologies. They realised golfers yearn for the same statistical feedback the pros enjoy on the PGA Tour, and are endeavoring to offer it - some well, some poorly. But which camp would Arccos 360 sit in? We travelled to Woburn and the Shire London to find out. How’s it different from the original product? The second generation Arccos 360 offers lighter, smaller tags, and the system is designed to be more accurate across the board. Like most tracking systems, Arccos requires users to screw tags into the butts of their clubs, which connect to a free app. It’s a painless and relatively quick process to get set-up. When users are getting ready to play, golfers do need to download courses, which can be problematic if you’re out of data, or the wifi at your club is dodgy. Arccos 360 is one of the few tracking systems that does not require tagging of any sort - and that’s a massive plus for the system. Golfers have to place their phone in their pocket in order for the system to work, and the sound of contact triggers the device into action. I know some testers grumbled at not being allowed to store their phone in a bag, but to those people we would suggest buying trousers that aren’t so tight. Golfers can inspect their progress as they play, allowing them to keep abreast of how their stats are stacking up. It also allows players to see if their digits are being recorded correctly - if not, and we only encountered a couple of instances over three rounds when shots were missed - golfers can quickly add or amend their round. The accuracy is impressive, as we were checking yardages against a range finder. Feedback will show you how far you are hitting each shot, and the smart algorithm sieves out any anomalies - such as chip shots with an eight iron. Players can view their strengths and weaknesses, with each area of their game given a handicap. For example, your driving could be as good as a seven handicapper, but your putting may be akin to a 28 handicapper. Overall, we found the system worked much better on iOS than on Android - we were getting more missed shots on Android devices, and we were getting a few funky yardages. This new system has improved on how much it drains your battery, and it can be used on flight mode which is a great option. However, if you have an old phone, you will see your battery drain fairly steadily. On a phone that is two years old, we saw 40% of the battery go after nine holes. A solution to this is to get a battery pack, or get a new phone/battery, which will easily go 18. The app is superb, both easy to use and informative. It is also linked to social media, so you can boast about your prowess on the course. Golfers can also engage in challenges such as “king of the hole” which allows users compete in long drive contents. Requiring no tagging at all, and providing accurate, instant data, Arccos 360 is one of the best golf tracking systems on the market. The second generation offers smaller tags and better accuracy, and is well worth the upgrade. The system does not work as well on Android devices, and will drain you battery if you have an old mobile phone. 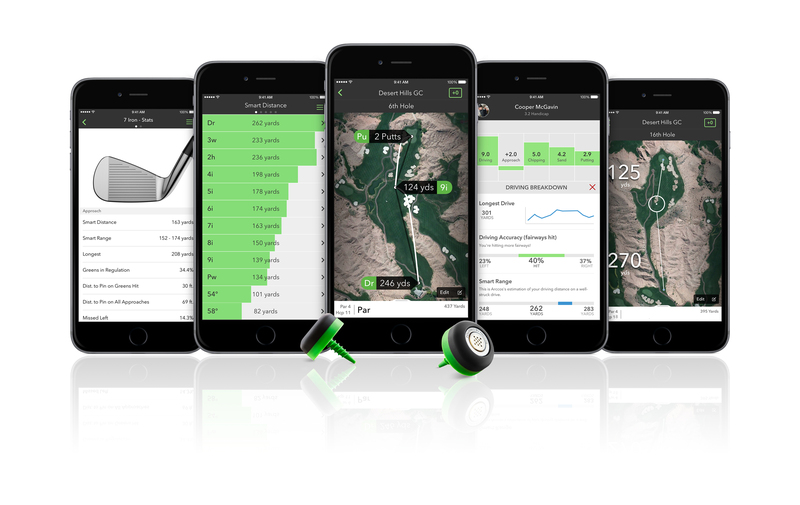 It has the best app of any golf tracking device, showing golfers their numbers in an engaging, easily digestible manner. One of the best golf tracking products out there for 2017. Head to the Arccos website for more.